IR reception dongle connects to Barix Exstreamer devices via the built-in serial port. 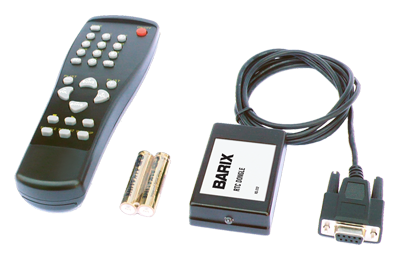 The IR Remote Kit connects to the serial port of a Barix Exstreamer device, receives IR signals From typical IR remote controls and forwards the received signal to the Exstreamer for processing. Power is supplied by the Exstreamer.